That is the estimated size of the B2B market in 2021, according to a new projection from Bank of America. It's not completely clear how that market is defined, but appears connected to supplies and other goods that conceivably could be ordered on line. The point of the report is that this B2B market could be the next driver of growth at Amazon, and that it is actually much larger - nearly double - the firm's estimate of $761 billion market for consumer ecommerce. And make no mistake, Amazon is well aware of that potential. It started a business unit called Amazon Supply seven years ago, but it is now been rebranded as Amazon Business. The offering "combines positive attributes of Amazon's consumer marketplace," such as broad selection and delivery convenience with the products and benefits that are "tailored for businesses, government organizations and the education sector," wrote Bank of America analyst Justin Post. "B2B has many more hurdles to adoption given the complex (and often offline) procurement processes, but Amazon is driving steady adoption," Post added. Bank of America also believes that it's realistic to expect that by 2021 Amazon Business will capture 10%of the B2B market in the U.S. and 5% of the international B2B market. That is by how much the stock price of XPO Logistics fell in December after a financial firm that bet against the company's shares issued a highly negative report claiming XPO of hiding losses through aggressive accounting. 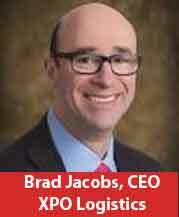 It also criticized the acquisition strategy CEO Brad Jacobs used to build XPO into one of the largest logistics and freight transport providers in North America. XPO says that the report was "intentionally misleading, with significant inaccuracies." Nevertheless, with that stock price pressure, XPO decided to put further deal making on hold, even though the company said that before the report it had planned to spend up to another $8 billion on more acquisitions, according to an article last week in the Wall Street Journal. Rather, it has announced plans for two share buyback programs totaling some $2.5 billion that it hopes will send shares higher. The company was close to doing an acquisition when share declines pushed XPO to turn to stock buybacks, the WSJ reports. That was the level of US manufacturing output in February according to the monthly index from the US Federal Reserve Bank, down for the second straight month versus the previous month. That has some observers worried about a manufacturing slowdown indicative of an overall economic drop, but the fall was modest, just half a percentage point. The index was up a single percent versus the same month of 2018. The Index has a baseline of 100 using the average month in 2012, meaning output is up just 4.8% since then, less than 1% per year. Separately, the Fed also said it now expects the US economy to grow at a rate of 2.1% this year, lower than the 2.3% it had projected in December, and below the 2.9% growth seen in 2018. That was the year-over-year growth in February in the Cass Linehaul Index, which measures US per mile truckload rates before full surcharge and other accessorial fees. That was down a little from the 6.4% rise in January, but was still significant, and marked the 17th straight month the index has been up 5% or more over the previous year, with rates compounding on themselves every moth, in continued bad news for shippers. Truckload linehaul costs are now just shy of the all-time high established in December 2018. The two-year stacked increase is 11.9%. "We expect continued rising costs in coming months, but at slightly lower percentage increases," said Cass analyst and commentator Donald Broughton. Cass added that after peaking above contract rates briefly in 2018, spot rates are now below contract rates by a more 'normalized' margin. So while rate increases are slowing and expected to continue to do so for the rest of 2019, they are still heading north, pushed by a driver shortage that limits capacity increases.